The Great Recession of 2007-09 was followed by a sharp drop in the U.S. birthrate, which has yet to reverse. The birthrate in 2013 was a record-low 62.9 births per 1,000 women ages 15 to 44, according to preliminary data from the National Center for Health Statistics. 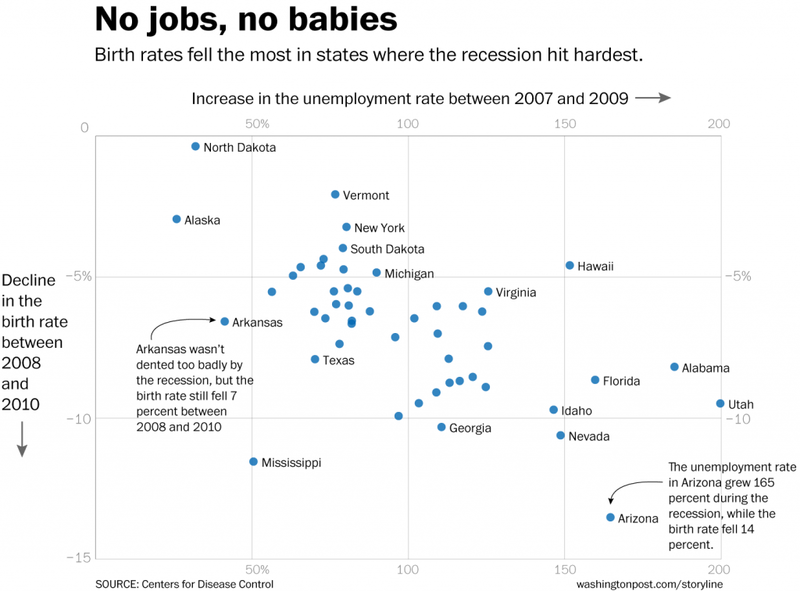 But just as the recession hit some states harder than others, birthrates generally declined more in states most affected by the slump. That’s illustrated by this chart, from The Washington Post’s new Storyline project. States such as Nevada, Arizona and Florida that saw some of the biggest plunges in home values after the housing bubble burst had some of the biggest birthrate declines between 2008 and 2010. Conversely, birthrates fell only slightly in North Dakota and Alaska, states that avoided the worst of the recession due to the boom in oil and gas production. The Post’s Jeff Guo noted (and Pew has well documented) that similar birthrate dips occurred after recessions in the 1970s and 1990s, and births likely will rebound as the economy regains its health. But as Fact Tank reported last month, the post-recession decline in births already has slowed the nation’s projected shift to a majority-minority youth population.